Vertical post used in mooring, traffic, etc. 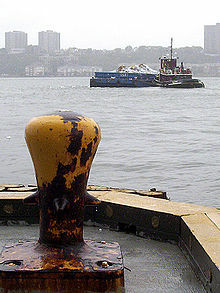 Mooring bollards, such as this one in the Hudson River in September 2005, were the first type of bollard: the use of the term has since expanded. A bollard is a sturdy, short, vertical post. The term originally referred to a post on a ship or quay used principally for mooring boats, but is now also used to refer to posts installed to control road traffic and posts designed to prevent ram raiding and car ramming attacks. The term is probably related to bole, meaning a tree trunk. The earliest citation given by the Oxford English Dictionary (referring to a maritime bollard) dates from 1844, although a reference in the Caledonian Mercury in 1817 describes bollards as huge posts. Previously, simpler terms such as "post" appear to have been used. The Norman-French name boulard (still often found in Normandy) and Dutch bolder may be related. From the 17th and 18th centuries, old cannon were often used as bollards on quaysides to help moor ships alongside. The cannon would be buried in the ground muzzle-first to approximately half or two-thirds of their length, leaving the breech (rear end) projecting above ground for attaching ropes. Such cannon can still occasionally be found. Bollards from the 19th century were purpose-made, but often inherited a very similar "cannon" shape. Bollards can be used either to control traffic intake size by limiting movements, or to control traffic speed by narrowing the available space. Israel's Transportation Research Institute found that putting bollards at highway exits to control traffic also reduced accidents. Internally illuminated traffic bollards have been in existence throughout the United Kingdom and Ireland since the 1930s, although the term "bollard" only seems to have been in common use since the late 1940s. An illuminated bollard has a recessed base light unit in the foundation which illuminates the traffic bollard from all angles. The main components are housed below the road or pedestrian surface (typically a concrete surface). Therefore, if a vehicle strikes the traffic bollard, the units below the surface are not damaged. Flexible bollards are bollards designed to bend when struck by vehicles. They are typically made from synthetic plastic or rubber that is stiff on its own, but pliable under the weight of a car or truck. When struck, flexible bollards give way to some extent, reducing damage to vehicles and surrounding surfaces, and return to their original, upright position. Some flexible bollards do not provide physical protection from vehicles; rather they offer clear visual guidance for drivers. Other flexible bollards have been designed to provide physical protection as well as reduced damage by incorporating strong elastic materials. These can be all plastic or plastic/steel hybrids but combine varying degrees of stopping power and flexibility. A planter provides protection in Washington, D.C.
Bollards are used by government agencies and private businesses to protect public spaces, buildings, and the people in them from car ramming attacks. 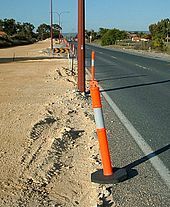 They usually consist of a simple steel post either anchored to concrete, cored into a hard surface, buried in the ground or secured on a self-locking taper or impact recovery system to protect the surrounding foundations when a bollard is struck. Bollards are widely used to contribute to safety and security. The American Bar Association (ABA) states that bollards are used to contribute to homeland security. The American National Institute of Building Sciences site—the Whole Building Design Guide (WBDG)—recommends in its Design Guidance that open spaces surrounding and contiguous to buildings be included as integral parts of a security design. crash- and attack-resistant bollards, a hardened barrier systems used to protect military, governmental and other buildings or compounds of higher security levels. They are often used by retailers to prevent "ram-raiding" burglaries. 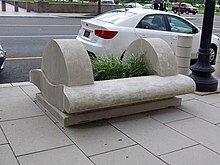 Large concrete planters are a decorative alternative to traditional bollards. Rising bollards are increasingly common around the world to hinder vehicle-based terrorist actions from achieving close proximity to buildings, and are also used to prevent terrorist vehicle-ramming attacks such as the 2007 Glasgow International Airport attack. They are also useful in mixed-use public spaces, which support both pedestrian use and emergency or service vehicle use. These bollards are usually priced between $11,000 to $100,000 depending on their ability to resist ramming vehicles, based on speed and size of the vehicle. The most expensive bollards can stop vehicles at speeds of about 50 mph (80 km/h). High security bollards are impact-tested in accordance with one or more of three major crash test ratings for vehicle barriers. These are PAS 68 (UK), IWA-14 (International) and ASTM (US). Such bollards are used for hostile vehicle mitigation and are designed to protect against potential vehicle borne improvised explosive devices (VBIED) and vehicle as a weapon (VAW) attacks such as those seen in the Nice attack in 2016 and the Westminster Bridge attack in 2017. According to the International Fire Code (IFC-2009) and the American National Fire Protection Association Fire Code 1 (NFPA-1) all new buildings or renovated buildings must have fire access roadways to accommodate fire apparatus and crews and other first responders. Thus the choice of bollard styles must apply to the NFPA’s Code 1710. Bollards are now designed in terms of how long it takes to remove or collapse them to allow first responders entry to the access roadway. In Antwerp, Belgium, artist Eddy Gabriel transformed a bollard to look like a toadstool in 1993. This example was followed by other artists, turning the quayside of the river Scheldt into a street art gallery. In Norwich, England, a set of 21 bollards was installed in 2008 in the Lanes area north of City Hall, designed by artist Oliver Creed and commissioned by the City Council as part of a regeneration programme. They are coloured "madder red", in reference to the red dye extracted from the madder plant and used for dying cloth, one of the city's major industries during the 16th century; and they bear bronze finials also alluding to local history. 10 of these depict the madder plant, while the other 11 have unique designs, usually relevant to the specific location in which the bollard is placed, including a scene of sheep-shearing, a Green Man, a swan's head in Swan Lane, and so on. 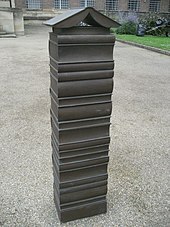 On the forecourt of Cambridge University Library, England, a line of 14 bronze bollards made to resemble piles of books was installed in 2009. This work, Ex Libris, was created by sculptor Harry Gray. The ten outer bollards are static, but the "books" making up the four central bollards can be swivelled, so that the lettering on their spines aligns to form the Latin phrase Ex Libris ("from/out of the books"), commonly used on bookplates. 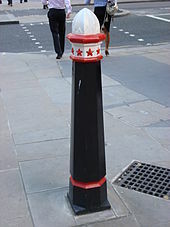 Wikimedia Commons has media related to Bollard, Decorated bollards, Mooring bollards and Traffic bollards. ^ "Online Etymology Dictionary". Etymonline.com. Retrieved 26 October 2013. ^ Boulting, Nikolaus (1976). "The law's delays: conservationist legislation in the British Isles". In Fawcett, Jane (ed.). The Future of the Past: attitudes to conservation, 1174–1974. London: Thames & Hudson. p. 13. ISBN 978-0-8230-7184-5. ^ Driver behaviour and accident records at unsignalized urban intersections. Abishai Polusa, Department of Civil Engineering & Transportation Research Institute, Technion-Israel Institute of Technology, Haifa 32000, Israel. June 1984. Available online 4 July 2002. ^ "Pavement parking". Department for Transport. Archived from the original on 8 April 2010. Retrieved 25 July 2009. ^ "Striking a Bollard". Simmonsigns.co.uk. Archived from the original on 3 March 2012. Retrieved 26 October 2013. ^ "Surrey County Council – Reflective bollards on traffic islands". Surreycc.gov.uk. Archived from the original on 30 October 2013. Retrieved 26 October 2013. ^ "Bell Bollard". Furnitubes International. Retrieved 18 May 2015. ^ "Urban Park Bollard". Archived from the original on 26 October 2009. ^ "Robotic Bollards to Take Control". BBC News. 28 April 2004. ^ "Reboundable bollard With Fixings". Bollard Shop. Retrieved 26 October 2013. ^ "REDUCING DAMAGE FROM VEHICLE-BOLLARD IMPACTS" (PDF). ^ "Flexible Bollard with Steel Core". ^ "Bollards & Goal Posts". ^ "Bollard Covers, Bollard Sleeves & Bollard Products for Sale". www.trafficsafetywarehouse.com. Retrieved 25 May 2017. ^ "Do bollards offer protection against vehicle attacks?". DW. 8 March 2018. Retrieved 8 April 2018. ^ Oakes, Charles. "PhD". Blue Ember Technologies, LLC. Retrieved 3 October 2012. ^ "Space Types | Whole Building Design Guide". Wbdg.org. Retrieved 12 June 2012. 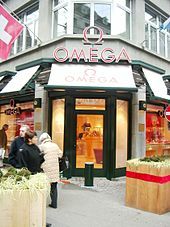 ^ Security for Building Occupants and Assets, Whole Building Design Guide, December 14, 2010. ^ Oakes, Charles G. "The Bollard: Non-Crash and Non-Attack-Resistant Models | Whole Building Design Guide". Wbdg.org. Retrieved 26 October 2013. ^ "BSI PAS 68". Retrieved 5 April 2019. ^ "ASTM F2656 / F2656M - 18a Standard Test Method for Crash Testing of Vehicle Security Barriers". www.astm.org. Retrieved 5 April 2019. ^ "Hostile vehicle mitigation | Public Website". www.cpni.gov.uk. Retrieved 5 April 2019. ^ "Bollards stainless pipe fabrication". Shawfab.com. Retrieved 26 October 2013. ^ "Bollard Guide". TKObollards.com.au. Retrieved 5 June 2018. ^ "NCEF Assessment Guide : Outdoor Athletic Facilities and Playgrounds" (PDF). Ncef.org. Archived from the original (PDF) on 29 October 2013. Retrieved 26 October 2013. ^ "NCEF Assessment Guide : School Grounds and Site Access Control" (PDF). Ncef.org. Archived from the original (PDF) on 29 October 2013. Retrieved 26 October 2013. ^ Oakes, Charles G. "Bollard design for trails and fire protection". Americantrails.org. Retrieved 26 October 2013. ^ "Bollards, NYC" (PDF). Retrieved 7 November 2012. 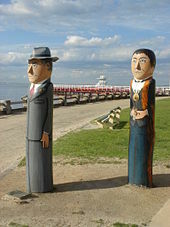 ^ "Geelong Bollards". Angelfire.com. Retrieved 26 October 2013. ^ witzenstein (24 July 2007). "Witzenstein: Who told you not to believe in fairytales?". Witzenstein.blogspot.com. Retrieved 12 June 2012. ^ Cocke, Richard (2013). Public Sculpture of Norfolk and Suffolk. Public Sculpture of Britain. 16. Liverpool: Liverpool University Press. pp. 64–5. ISBN 978-1-84631-712-5. ^ Reynolds, Leo. 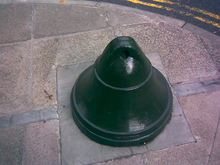 "Norwich Bollards: full set of photos of bollard finials". flickr. Retrieved 15 June 2013. ^ "Cambridge University Library Forecourt. Cambridge. 2009". Harry Gray. Retrieved 29 May 2015. ^ Beard, Mary (11 September 2009). "A Don's Life: Is it a bollard? Is it a sculpture? Is it a book?". TLS: The Times Literary Supplement. Retrieved 29 May 2015. ^ Greer, Germaine (4 January 2010). "My favourite library is being transformed into a beacon of naffness". The Guardian. Retrieved 29 May 2015. This page was last edited on 12 April 2019, at 11:11 (UTC).